The Tanglewood 1-Light Pendant Lighting Fixture is a round hanging pendant that sits at 13 inches tall and 16 inches in diameter. It hangs from a wire and chain combination and is turned on and off by a pull switch. The inner shade is white glass, and the outer shade is made of entwined rattan. Rattan is like wicker, but doesn’t crack and corrode over time like traditional wicker. 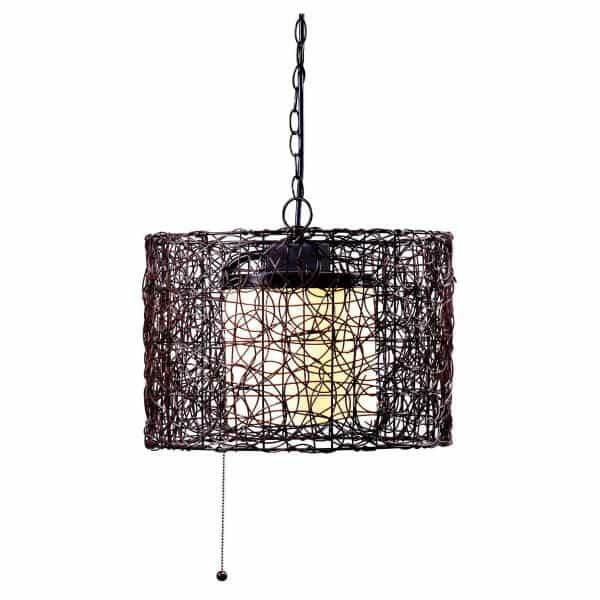 Coupled with the deep bronze finish, the Tanglewood Pendant may suit your wicker furniture set or carry your beach house vibe to another level. The pendant is certified by a safety testing organization for placement in potentially wet locations, and even the switches are waterproof. The safety organization called UL gives Tanglewood their stamp of approval for outdoor placement. The materials are rustproof and the pendant is weighted and constructed with the natural elements in mind. Rain or shine, windy or calm, the Tanglewood Pendant is engineered for steady hanging.